And so, it's time to buy a smart phone. My first motivation was an interest in touch interfaces. I explored some of those thoughts in my post All my devices are black. Secondly, as a composer and audio engineer, I thought it might be good to see what audio apps can run on a phone, now that they are little powerful computers. I covered that issue in my last post and the conclusion was that I cannot reconcile this desire with my cost constraints. Thirdly, a very practical consideration. When travelling I sometimes bring a laptop simply to check email, get a local map, and look up a few things on the internet. I definitely want to cut down on bulk and a smart phone is the obvious solution. I'll still need the computer for audio performances or big photographic projects. But I can leave it at home the rest of the time. My main constraint is price. My starving artist budget warns me off anything over 100 Euro. Plus I don't want a phone locked to any particular calling plan. Currently I pay the minimal sum of 20 Euro a month for mobile usage and hope to keep it that way. My plan is to stick with normal cell traffic for text and voice, and add to that WiFi for the internet. By ignoring 3G and 4G I can stay free of data charges. I was as surprised as anyone to discover that my goals are not unrealistic. In 2013 it is indeed possible to find an unlocked, fully-capable Android phone for 100 bucks (a buck, by the way, is a unit of generic currency, be it Euro, Pounds Sterling, or Dollars). The solution is to go for a Chinese brand. After all, the vast majority of mobiles are made in China. Some are stamped with famous brand names and fetch a premium price; others are not. After some research I found one particular model that seems to punch above its weight. JiaYu is a Chinese firm who make their own phones. The Jaiyu G2 has gone through various improvements and is currently available with a dual core MTK6577 chip (clocked at 1.0GHz), 1GB RAM, 4GB ROM, and the PowerVR SGX 531 GPU. It has a 4" capacitive multi-touch screen at 480x800 (resulting in 240dpi). It has quad band radios for use anywhere in the world, plus 3G (see notes below). It has the usual complement of sensors including compass, GPS, and AGPS. It supports Bluetooth 2.1 and has an FM radio. Connection to either the included charger or computer is with a bog standard USB cable (with one tiny end for the phone). There is nothing here that is proprietary. Nice! Like many phones designed for the Asian market, the Jaiyu G2 can hold two SIMs at the same time. This is perfect when travelling, since you can use different carriers to avail of the cheapest rates without roaming charges. The 8MP rear camera shoots video at 720p. The 0.3MP front camera is good enough for video calls. As a photographer I don't rate images from a mobile, but they are decent enough for documentation purposes. A MicroSDHC slot takes cards up to 32GB. Access to this (and the SIM slots) is through the battery compartment. I find it devilishly hard to remove the plastic back plate from the phone. Mine is already marked and damaged. The battery is 2050 mAh and reportedly lasts longer than certain other smart phones. A few provisos. Make sure you get a 1GB ROM model, since 512MB is simply not enough to do extensive multi-tasking -- one of the reasons Android rocks! Also, check that you are getting a dual core phone, since the G2 also exists as a single core variant. The phone can easily be rooted, and I'll explain the easiest way in my next article. The stock Android 4.0.4 can be updated to 4.1, something I need to try soon. I should note a couple things the phone cannot do. There is no 4G. And no USB Host mode, AKA USB On The Go (OTG). Oh well. 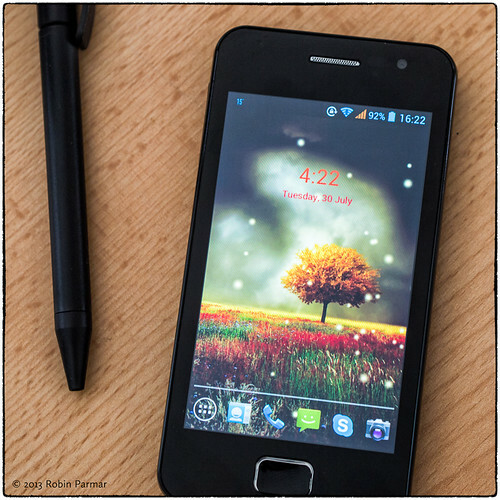 The phone is darned easy to use, much like any other Android device. It is thankfully not pre-loaded with bloatware. I found only two nice screen-savers and one Chinese social media app (I removed that). The keyboards was initially a dual English-Chinese type, which I replaced with Google Keyboard, getting access to both US and UK English dictionaries in the bargain. There is some sort of a glitch where perfectly normal words come up as spelling errors. I need to add words like "was" to the dictionary. If anyone has a fix for that, I'd be grateful! The voice recognition is remarkable in how accurately it works. My phone gets an Antutu benchmark score of 6259 (others report similar, e.g. 6430), which I read is pretty good. All I know is, the phone performs smoothly, with only small pauses when loading bigger apps. The WiFi connectivity seems very good. All-in-all I have little to complain about. Except that back plate. An external slot for the microSD would be great! The best part is the price. You can order it direct from China through Ali Express. They broker the payment, so it's a no-risk transaction. One seller will deliver the 1GB dual core model for €96. It's €11 more for DHL delivery, for those who don't want to wait a month. Be prepared to pay duty and VAT on arrival in your protected commerce zone (AKA "country"). The true cost then might be closer to €140. Still, this price makes iPhones look ridiculous. The Jaiyu G2 even trumps the Google Nexus, which has no SD slot or dual SIM support. It's unbeatable value. So no doubt I'll be writing more about Android soon.